Royal Naval Dockyard (generally referred to by cruise lines as King's Wharf) is home to two docks: King's Wharf and Heritage Wharf. This area makes up one of Bermuda's three ports (which also include Hamilton and St. George's), and it's the port of choice for larger ships calling on the island. Located at the West End of Bermuda on Ireland Island in Dockyard Parish, the port was built for the British Navy as a base between Halifax and the West Indies. The Georgian-style fort later served as a North Atlantic base during both World Wars. Finally abandoned in 1951, its reincarnation gives visitors plenty to do and see, what with the National Museum of Bermuda, the Arts Centre and the Bermuda Craft Market. The parish's isolation is part of its charm, and it translates to romance and privacy with significant others. King's Wharf is rich in naval history with an endless array of activities for all ages, be it culture, water sports, good food, shopping or kicking back at the beach. In addition to galleries, craft markets and museums, you can include world-class golf courses, parasailing, scuba-diving and dolphin swims on the short list of things to do. Trek up nearly 200 steps to the top of historic Gibbs Hill Lighthouse in Southampton; then follow it up with a listen to the lovely Gregorian chants of three nuns inside a teensy 1620 chapel at the Heydon Trust in Somerset. Shop at the Clocktower Mall, or pick up a scrumptious rum cake at the Bermuda Rum Cake Company, hop a ferry to anywhere, or stroll through the Arts Centre to view the works of Bermuda's premier artists. 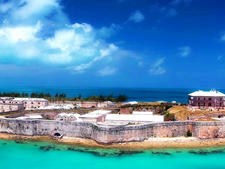 You'll call on the Royal Naval Dockyard in Dockyard Parish at the West End of Bermuda. 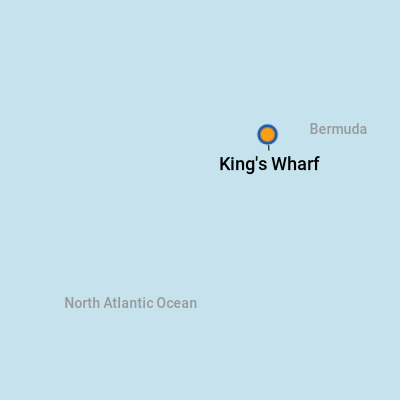 Your ship will pull up to one of two docks: King's Wharf or Heritage Wharf, which are located right next to one another in the main port area. The sprawling Royal Naval Dockyard six-acre complex gives visitors plenty to do and see -- with every convenience close at hand. You'll find buses, taxis, tours, a bike-rental shop and a stop for the ferry, which is the fastest way to explore the island beyond the Royal Naval Dockyard. If you're exploring the island via taxi or bus, don't be alarmed if you hear drivers routinely beeping at one another. Unlike in America, it's not hostile; rather, it's just a friendly indication that they know each other. It's also fun to note the differing colors of license plates on scooters you see whizzing around town. The plates of tourists who have rented scooters during their stay are marked with a certain color to warn locals. The people of Bermuda are friendly and helpful, but it's always good to be aware of your surroundings. 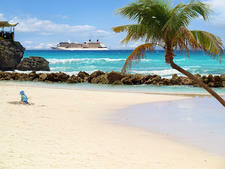 Leave any unnecessary valuables and cash in your stateroom safe. By Scooter: Sure, those mopeds are cute, and you'll be tempted to rent one, but we suggest thinking twice if you're a newbie. The roads are narrow and winding, and you'll find yourself spending a good deal of time getting out of the way of speeding locals who don't care whether they pass on the left or right -- to say nothing of that cumbersome left-side driving detail. If your heart is set on a scooter, you should still consider a taxi for evening outings and rainy days. You'll need a driver's license, helmet and insurance. (The rental company includes the last two in the rental fee.) You also must be over the age of 16. Ask about multi-day prices. By Bike: Conventional bikes (livery cycles to the locals) are rentable at just a few shops throughout the island -- but use caution, as Bermuda is known for its steep hills. If you don't want to splurge on renting a bike helmet, bring one from home. By Bus: The pink and blue buses travel along all major roadways, making stops every 15 minutes, except on Sundays and holidays when it's every hour or, on some routes, not at all. The good news is that buses really aren't a bad way to sightsee. The bad news is that they'll eat into the time you have on the island. You'll need exact change in coins (or tokens) for the fare box. Transportation Passes for one or three days are also available for unlimited use in all zones. By Train: The Bermuda Train Company does 20-minute loops from the Royal Naval Dockyard to the cruise terminal from 8:30 a.m. to 5 p.m., allowing for five hop-offs at various locations. By Ferry: Time-saving ferries crisscross the Great Sound between the City of Hamilton and King's Wharf. You can even take mopeds and bikes onboard most routes for an additional fee. By Taxi: Taxis are plentiful but pricy. If you want to use one for sightseeing, we suggest taking ones that have blue flags on the hoods. That means the driver is government-qualified to give tours. Fares increase by 25 percent between midnight and 6 a.m., Sundays and holidays. Taxi stands are located next to the Craft Market near the National Museum of Bermuda, in front of the Clocktower Mall and at the Cruise Ship Terminal. Note: The Visitor's Centre near the Ferry Dock shut down on April 30, 2018. A new Visitor's Centre is planned for Front Street but the website contains no information on if it opened yet. Legal tender is the Bermuda dollar, which is divided into 100 cents. BD$1 = US$1. U.S. currency is accepted in shops, restaurants, and hotels, but currency from Britain, Canada and other foreign countries is not. Getting money is easy at ATM's and banks. The Bank of Butterfield ATM is located at the Clock Tower Mall, and an HSBC Bank of Bermuda ATM is located near the Victualing Yard. The nearest actual bank branch is located in Somerset Village, about a five-minute ride from the port. For more currency exchange information, visit www.oanda.com or www.xe.com. 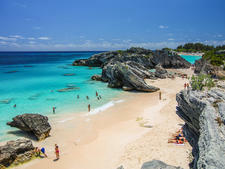 English is the official language in Bermuda. 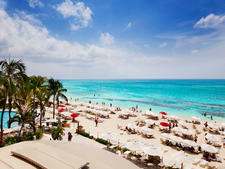 You'll find plenty of traditional dishes like fish chowder laced with black rum and hot peppers, or hashed shark. And definitely order anything made with their fabulous Bermuda onions. One aspect of Bermuda we find refreshing is its lack of fast food. One Kentucky Fried Chicken stands on the island, and it was erected prior to regulations that were passed to prevent famous venues like McDonald's and Berger King from taking up residence. Cafe Amici: At this charming venue, located in the Clocktower Mall, you'll find delicious Italian fare, prepared with fresh ingredients. Bermuda offers its best deals on U.K. imports like cashmere sweaters and Harris tweeds. You're shopping duty-free in many places, so that means prices run at least 20 percent less than in the U.S. You might get closer to a 40 percent range at some places, but prices aren't as good as they once were. Other souvenirs? Pick up some ginger beer (it's an acquired taste) and Gosling's rum to make a Dark 'n' Stormy back home. Don't forget the Bermuda shorts! Shop big-name (but less stocked) outposts such as Trimingham's-Smith's, the Crown Colony Shop and Crisson Jewelers at the Dockyards for your take-home treats. You might also want to check out the Bermuda Craft Market, Glass Blowing and Rum Cake Factory and Bermuda Clayworks -- all located in Dockyard, most at the Clocktower Mall. Although the mall is not duty-free, there's no sales tax in Bermuda, so the price you see is the price you pay.